The Film Foundation, the movie-restoration organization founded and chaired by Martin Scorsese, has partnered with the Pan African Federation of Filmmakers (FEPACI) and UNESCO in a project to locate, restore and preserve films made on the African continent. Dubbed the African Film Heritage Project, the group will identify 50 films with historic, artistic and cultural significance, then work to restore them. The last films showing as part of the Museum of Moving Image's Scorsese retrospecitve are going to be films he's helped restore, including The Color of Pomegranates. King of Hearts has already been released on BD in France a few months ago using this restoration. The 2 Costa Gavras have been released in the French boxset in november 2016 (but wrongly encoded in 1080i50). At the most recent CNC session they funded, among others, restorations of Jean-Pierre Melville's When You Read this Letter, Max Ophüls' La Ronde, and Patricio Guzman's Battle of Chile. "In 2016, Eclair restored 25 Gaumont features, including Louis Malle’s My Dinner With André (1981), Maurice Tourneur’s Samson (1936) and André Barsacq’s Le Rideau Rouge (1952). Titles selected for 2017 include Julien Duvivier’s Untel Père Et Fils (1945) and L’homme Du Jour (1937) Jacques Doillon’s La Femme Qui Pleure (1979) and Robert Bresson’s Lancelot Du Lac (1974)." 1946: La Bataille du Rail (Battle of the Rails) by René Clément (1h25, France): Grand Prix International de la mise en scène and Prix du Jury International. 1953: Le Salaire de la peur (The Wages of Fear) by Henri-Georges Clouzot (1952, 2h33, France, Italy): Grand Prix. 1956: Körhinta (Merry-Go-Round/Un petit carrousel de fête) by Zoltán Fábri (1955, 1h30, Hungary): in Competition. 1957: Ila Ayn? (Vers l’inconnu ?) by Georges Nasser (1h30, Lebanon): in Competition. 1967: Skupljači Perja (I Even Met Happy Gypsies/J’ai même rencontré des Tziganes heureux) by Aleksandar Petrović (1h34, Serbia): in Competition, Grand Prix Spécial du Jury ex-æquo, Prix de la Critique Internationale - F.I.P.R.E.S.C.I. ex-æquo. Presented by Jugoslovenska Kinoteka/The Yugoslav Film Archive and Malavida. New 35mm print from the original negative in perfect shape then scanned in 2K and cleaned up. 1966: Blow-up by Michelangelo Antonioni (1h51, United Kingdom, Italy, United States of America): Grand Prix International du Festival. Presented by Criterion, Cineteca di Bologna and Istituto Luce - Cinecittà, in collaboration with Warner Bros and Park Circus. Restoration work carried out at Criterion, New York and L’Immagine Ritrovata, Bologna under the supervision of Director of Photography Luca Bigazzi. 1969: Matzor (Siege/Siège) by Gilberto Tofano (1h29, Israel): in Competition. 1970: Soleil O (Oh, Sun) by Med Hondo (1h38, Mauritania, France): Semaine de la critique. Presented by The Film Foundation. Restored by Cineteca di Bologna at L’Immagine Ritrovata laboratory in collaboration with Med Hondo. Restoration funded by the George Lucas Family Foundation and The Film Foundation’s World Cinema Project. 1976: Babatu, les trois conseils by Jean Rouch (1h33, Niger, France): in Competition. Presented by the CNC, Inoussa Ousseini, the Comité du film ethnographique and the Fondation Jean Rouch. Digital restoration made from the 2K digitization of the 16mm negatives. Restoration carried out by L21. 1976: Ai no korîda (In the Realm of the Senses/L’Empire des sens) de Nagisa Oshima (1h43, France, Japon): Quinzaine des Réalisateurs. 1979: All that Jazz (Que le spectacle commence) by Bob Fosse (2h03, United States of America): Palme d’or ex-æquo. 1981: Człowiek z żelaza (Man of Iron/L’Homme de fer) by Andrzej Wajda (2h33, Poland): Palme d’or. 1982: Yol – The Full Version (The Way/La Permission) by Yilmaz Güney, directed by Serif Gören (1h53, Switzerland): Palme d’or ex-æquo à l’unanimité, Prix de la Critique Internationale – FIPRESCI. 1951-1999: A short history of short films presented by the Festival de Cannes. A program curated by Christian Jeune and Jacques Kermabon. Spiegel van Holland (Miroirs de Hollande) by Bert Haanstra (1951, 10mn, The Netherlands) / La Seine a rencontré Paris by Joris Ivens (1958, 32mn, France) / Pas de deux by Norman McLaren (1968, 13mn, Canada) / Harpya by Raoul Servais (1979, 9mn, Belgium) / Peel by Jane Campion (1986, 9mn, Australia) / L’Interview by Xavier Giannoli (1998, 15mn, France) / When the Day Breaks by Amanda Forbis and Wendy Tilby (1999, 10mn, Canada). Presented by Jacques Rozier and la Cinémathèque française. 4K Digitization and 2K restoration works made from image and sound negatives at Hiventy laboratory, with the support of the CNC and in collaboration with Les Archives Audiovisuelles de Monaco, la Cinémathèque Suisse and Extérieur nuit. The film will be introduced by Jacques Rozier. "February 13, 2017: Bernard Eisenschitz is currently carrying out a new restoration, reportedly in order to correct the more fanciful changes in the previous restoration that is being considered here.]" - it seems that Eisenschitz will delete some outtakes added to the film in 1990. He also wants to do a big Claude Autant-Lara box, but some titles are owned by parties that do not finance restorations. "Douce" is not yet HD-ready (problems with one of the rights holders). Soulet says: "If I wait until it is all restored in HD, the box will never be released" (my paraphrase). Upcoming: a Clouzot box and The Black Tulip (1964). They´ve also released La Vie en Chateau and several early Philippe de Broca films. I hope this is the relevant sub-forum where I could post this topic, since these studios are in Europe and tackle mainly with international films' restorations. I think it's time there was a seperate topic about these 2 studios, because we see many posts here and there about certain films and how they change their colors to a specific palette despite year, DOP, director, ethnicity. At best, the teal affects mainly the greys-blues. -Do you agree, that there is evidently a trend in the restorations by these 2 studios or is it just a pure coincidence (or a conspiracy theory ) that dozens of films look exactly the same? -Why do these studios keep going and do what they do? -Why this problem hasn't been addressed more officially on the internet but we turn the blind eye? -Why don't any of the more knowledagble and in the restoration business persons say anything about it and do something to stop it? Anyway, I hope we have a civil converstation on this matter, which has proven most controversial at other times. I see, my thread was moved. Well, this is exactly what I meant. Why can't we have a seperate thread, and maybe draw the attention to what's happening there? if we keep burrying the subject, this thing will go on an on. Report of the most recent CNC sessions (April) lists restorations of Jacques Rivette's L'amour fou, Godard's Grandeur et décadence d'un petit commerce de cinéma, Resnais' Last Year in Marienbad, Bresson's Trial of Joan of Arc and Renoir's Rules of the Game amongst others. Are silent film restorations of films before 24fps became standard, generally restored to playback at the correct speed at when show at 23.97/24p? I'm wondering specifically whether this was the case before HD was standard and the expectation was that they would primarily be seen on a PAL DVD? With an HTPC, I can get my PAL DVDs playing back at 24p. Do I want to watch the Chaplin Keystone and older Edition Filmmuseum titles like so, or am I introducing slowdown when they were specifically restored for PAL viewing? Finally the Come and See restoration is complete! It's great to see Kadokawa finally stepping up their game. Tantalisingly the rushes for Zero de Conduite are shown with the restored Gremillon but unfortunately we have only the 48 minute butchered version of Dainah to savour. The rushes program at Bologna for Vigo were for l'Atalante, Kevin. I don't recall any rushes program there for Zero. There was a short commentary on the extra minute or so (in three shots basically) for Zero which all amplify the part of Tabard, the queer kid. They are sublime, including a long bedside lover's good night between Tabard an one of the other boys where they start the first talk of a revolt. The first slightly longer shot is the gruesome chalk covered old teacher who fondles Tabard's hand for too long provoking hm to the great outburst ("je vous dit merde!"). And there's a silhouette shot of the "inpector" sticking a hypodermic into his arse. The 11 reels of rushes are all for l'Atalante and are essential for life. Amongst it all, the cats, Vigo himself snapping the clap board, are four single takes of the Peddler singing his nonsense song to the bar, shot from above, each side of the "cage": with the couple on the other side and within the cage with a tilting camera, all with audio unlike most of the 11 reels. Esienschitz narrated this powerhouse live from offscreen in French, his contribution is of course critical to any possible BD release. TMDaines wrote: Are silent film restorations of films before 24fps became standard, generally restored to playback at the correct speed at when show at 23.97/24p? I'm wondering specifically whether this was the case before HD was standard and the expectation was that they would primarily be seen on a PAL DVD? The Novecento restoration is a new one? 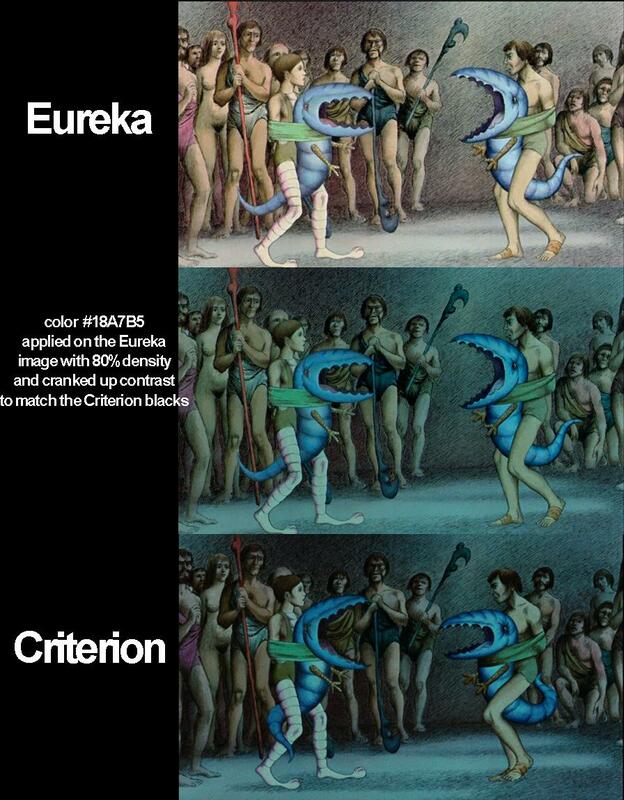 The Eureka version wasn't restored? Costa wrote: The Novecento restoration is a new one? Probably, I think Venice usually only screens premieres of new restorations in its Classics line up. The newest CNC report includes funding for restorations of Rivette's La Religieuse, Borowczyk's Immoral Women, Grémillon's Daïnah la métisse, and 300 Lumière films. Film remastering and new score supported using public funding by Arts Council England, alongside additional support from Matt Spick; PRS Foundation’s ‘The Open Fund’; the George Harrison family, on behalf of the Material World Foundation; and all donors to the BFI’s Film is Fragile fundraising campaign. The restoration and new score are part of the BFI’s contribution to the UK-India Year of Culture 2017. 2K restoration and editing by George Willeman and Valerie Cervantes, Library of Congress. Further restoration by Lori Raskin, An Affair with Film with Milestone Films. Materials courtesy of the BFI National Archive, Library of Congress and the New York Public Library Jerome Robbins Dance Division. The film was digitally remastered in 2K through the BFI’s Unlocking Film heritage programme. Digitally restored in 4K resolution from the original 35mm negatives by Cinelicious in Los Angeles. 4K scanning by IMAGICA Corporation in Japan. Restored in 4K by the BFI National Archive and The Film Foundation, with funding provided by the George Lucas Family Foundation. Restored in 4K by Sony Pictures Entertainment. In collaboration with the BFI’s Unlocking Film Heritage Programme. Restored in 2016 by Filmarchiv Austria at Synchro Film, Wien from a 35mm nitrate print. Restored by Cineteca di Bologna at L’Immagine Ritrovata laboratory in association with Instituto Cubano del Arte e Industria Cinematográficos (ICAIC). Restoration funded by Turner Classic Movies and The Film Foundation’s World Cinema Project. Special thanks to Bundesarchiv-Filmarchiv and the BFI National Archive. 4K Restoration by Criterion and Warner Bros.
Casanova - Alexandre Volkoff – 1926 – Collections La Cinémathèque française’. HD digital scan of the original nitrate negative and 4K scan of vintage diacetate print (pochoir sequences) from our collections. Restored in 4K by NBCUniversal StudioPost, thanks to the Cinémathèque Québécoise as well as MTI Film in Los Angeles for providing additional film services. Restored in 4K in 2016 by Videa at TLE Films Laboratory from the original camera negative and intermediate negative elements. La Vérité is restored in 4K by Sony Pictures Entertainment in partnership with The Film Foundation and RT Features. At long last- I was starting to be concerned A Matter of Life and Death wouldn't see the fancy Archers restoration treatment for some reason! That may well explain why the DVD / Blu of Frantz Fanon kept getting delayed. Had a feeling La Verite would be on the docket one day. L-Shaped Room is a very nice surprise. That animation programme ‘From Jealous Dolls to Brutish Bulldogs’ is right up my street. Hopefully BFI can find a way to put those remastered titles out too. The archive films are the only reason I'm usually interesting in the LFF. Ticket prices are so high for the interesting films; at least these are at regular BFI prices. Even in Argentina they have restored several films but not the impressive ones Leopoldo Torre Nilsson made in the 50-60s.